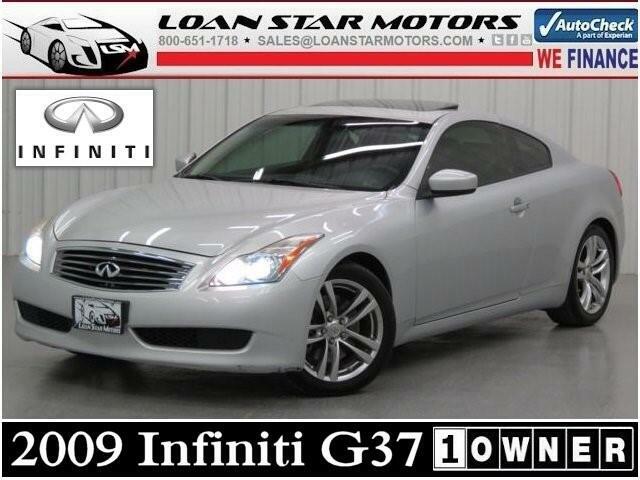 ***2009 Infiniti G37 Coupe Journey 2dr 3.7L 64k Miles Lthr Navigation Backup Camera***One Owner***100% Autocheck Guaranteed***We Finance***WAC *** Visit our website at www.loanstarmotors.com t o view 60+ pictures of this vehicle ***WE FINANCE***AS LOW AS 3.99% APR FINANCING ON QUALIFIED VEHICLES W.A.C. ***Another fine pre-owned vehicle offered for sale by Loan Star Motors of North Houston Humble TX * Contact our Sales Department for Complete Details at any Time at Toll Free *** 1- 800-651-1718 *** Low, low mileage coupled with an exacting maintenance program make this vehicle a rare find. This is about the time when you're saying it is too good to be true, and let us be the one's to tell you, it is absolutely true. At Loan Star Motors, we strive to provide you with the best quality vehicles for the lowest possible price, and this G37 Coupe Journey 2dr 3.7L 64k Miles Lthr Navigation Backup Camera is no exception. More information about the 2009 Infiniti G37 Coupe: Both Infiniti's 2009 G37 sedan and coupe offer sharp-edged performance but also luxury-car comfort. Infiniti has positioned the G-series to compete with BMW's 3-series luxury performance cars. This means the G37 features great seats, an elegant interior with attractive materials and very impressive audio systems. Both G models stand out for offering overall performance near the top of its class. The new coupe manages to step up its performance capabilities without reducing driver comfort, with a rear limited-slip differential, 4-Wheel Active Steer system and Sport Brakes on the options list. Interesting features of this model are Performance, stylish design, and attractive interior ***WE OFFER NATIONWIDE FINANCING OPTIONS * COMPETITIVE RATES, DISCOUNTED SHIPPING AND WELCOME TRADES * Extended Warranty Programs/Low APR Financing Available WAC. Physical Address: 5547 FM 1960, Humble TX, 77338-Toll Free 1-800-651-1718 - Visit us on the web at http://www.loanstarmotors.com All advertised prices exclude government fees and taxes, any finance charges, any dealer document preparation charge, and any emission testing charge. The price for listed vehicles as equipped does not include charges such as: License, Title, Registration Fees, State or Local Taxes, Dealer Prep, Smog Fees, Credit Investigation, Optional Credit Insurance, Physical Damage of Liability Insurance, or Delivery Fees. DEALER makes no representations, expressed or implied, to any actual or prospective purchaser or owner of this vehicle as to the existence, ownership, accuracy, description or condition of the listed vehicle's equipment, accessories, price, specials or any warranties. Any and all differences must be addressed prior to the sale of this vehicle. Your actual mileage will vary depending on how you drive and maintain your vehicle.